I took a course back in September that consisted of forty-eight hours of instruction over the course of eight Saturdays. 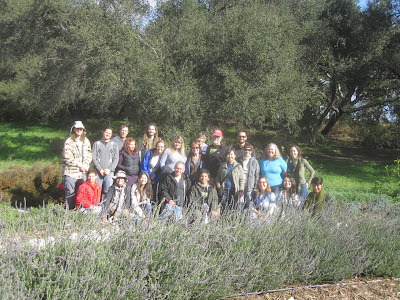 The course series was entitled Urban Eco-System Agriculture, it was held at The Huntington Library and Gardens and was taught by Darren Butler and Scott Kleinrock. The class was comprised of about 25 individuals all who are making an incredibly positive affect in their local communities. Class Photo on our last session. 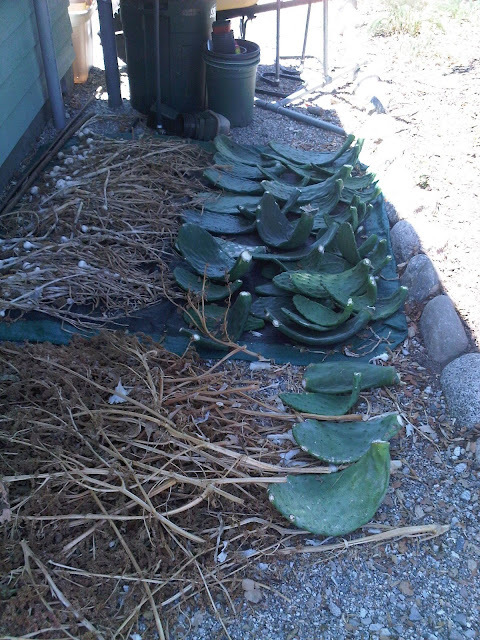 Some gardening gurus are missing from this photo. Reflecting back on this experience I can't help but close my eyes and transport myself to where it all started, the parking lot. Exiting our vehicle and walking through the early morning midst past the holly hedges and into the grandeur that is the Huntington Gardens is how each morning started. Approaching closer to our destination whilst passing mindful magnolias automatically made me feel as though a treasure awaited me at the end of this path. Covering this course in one blog post is impossible, however I hope my thoughts and reflections offer a good snapshot into some of the key teachings I was able to receive. How can we create thriving and resilient garden designs that peacefully coexist with nature in and around urban environments? The populations we live in are dense which limits space as well as natural resources, especially when considering the "big picture" of our ever growing nation. As a society we rely on large scale farming that has time and time again failed us and nature. Resilient food forest garden designs will not feed a neighborhood overnight. But, we need to start somewhere. Every little pocket of our nation has a different level of environmental literacy. My belief is that change will only arrive over time and by individuals inspired by leaders to make a change for themselves, and for the future of their families and community. If people don't fully understand "the why" they will not take action to change and adapt to a new lifestyle. 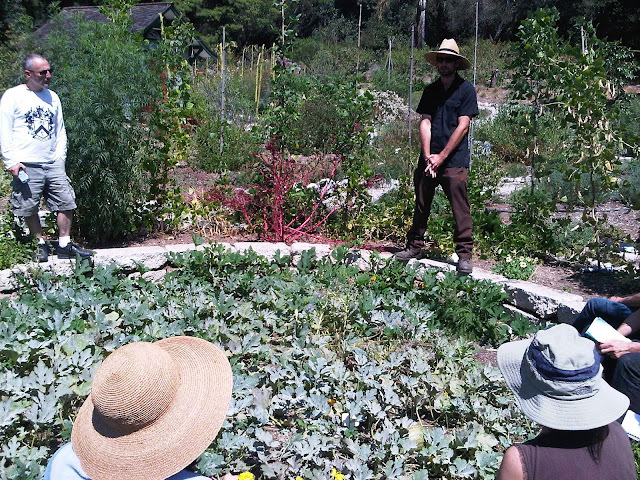 Scott lecturing on this particular garden design at The Ranch. 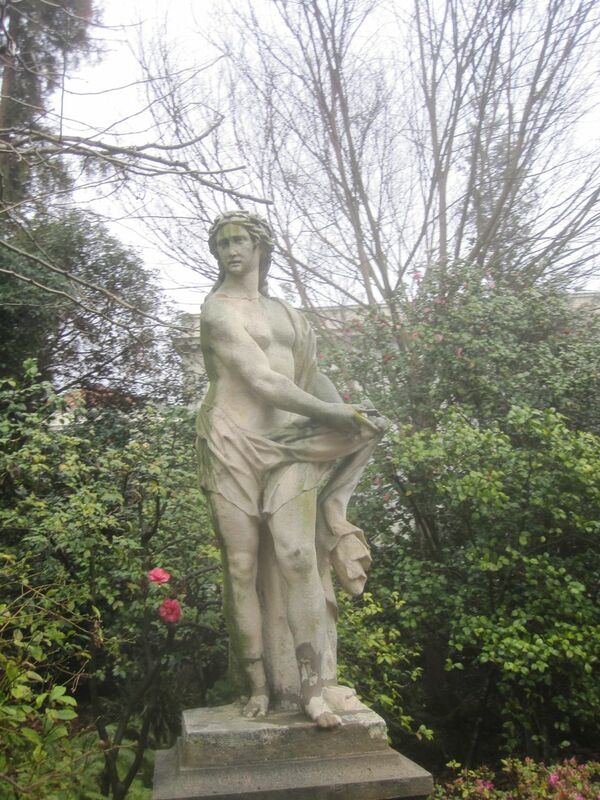 When it came to creating garden designs I was taking control of the situation by reacting instead of observing. Instead of looking at small scale farms for inspiration I now look to the forest, to nature. After all, she's been here a really long time and I have no interest in creating designs that do not last over time. 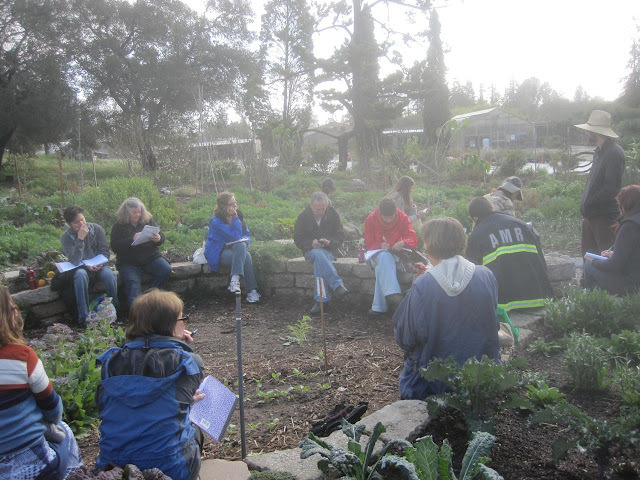 A key learning for me from this course was that we can create garden and landscape designs to heal broken systems and the answers lie within the wilderness and within the virtue of patience. Ranch Lecture during Fall season. Can't think of a better classroom. UEA session at The Huntington's Ranch towards the Winter season. 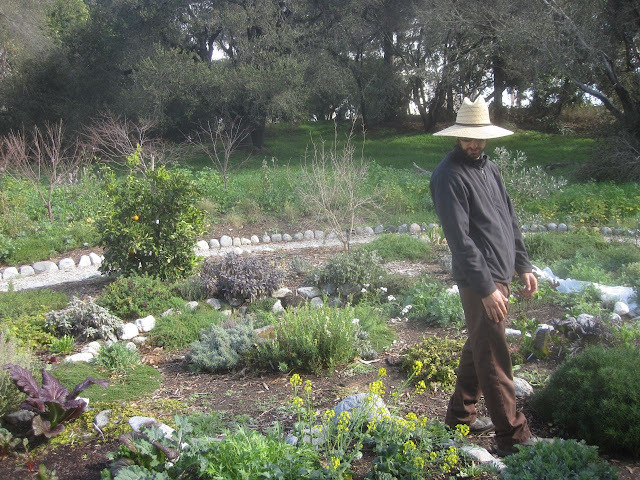 Studying local wild plants helps me create synergistic garden designs. Imagine a garden that requires little tending only harvesting and initial planning? I do. When hiking through our nearby trails I notice several edibles and medicinals, annual and perennial. I ask myself, "how do these plants survive?" Just like Darwin taught, Nature picks her survivors and these seeds have found the best possible conditions for themselves whether it be soil temperature, soil drainage or both. Embrace diversity and mix plants around, perfect rows are so passe. Experiment with the micro climates in your garden, let some plants reseed themselves, and most importantly nourish the soul of your garden, the soil. Here's a short list of some resilient plants that will support your garden's ecosystem. -Lots of herbs like, thyme, basil, lavender, sage, and marjoram. Let them flower so they can reseed. 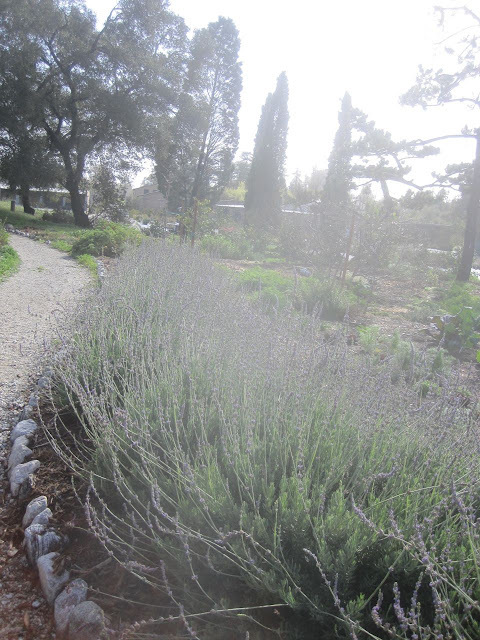 Row of Lavender at The Ranch. If possible incorporating one or more of these features will also aide in your ecosystem garden design. Those marked with * are highly encouraged. 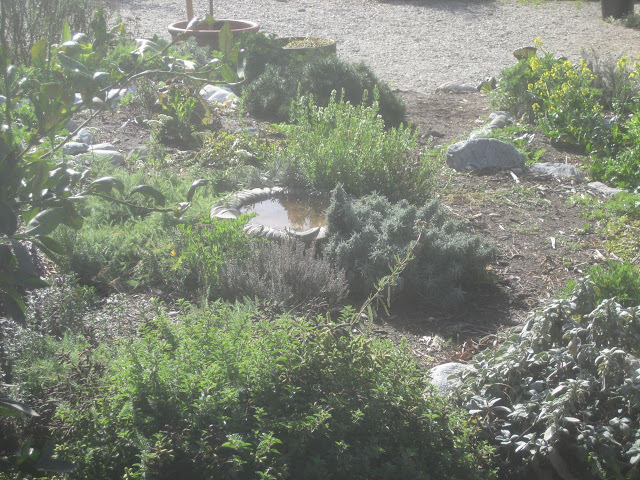 Birdbath surrounded by herbs at The Huntington's Ranch. And just like the end of all of our classes I leave you with a poem or I should say a Manifesto. This is one of my favorites that our Teacher, Darren read aloud early on in our sessions. Thank you Milli! Hope to see you soon.